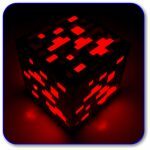 What is redstone? How can it be used? This class will start with learning the basic redstone components and will move up to some really exciting redstone machines that will amaze your friends! Each week you will watch a video focused on the concepts and designs possible with redstone. The in-game build will then challenge you to apply what you have learned by creating the redstone contraption that you learned about that week.